Virgin Care is committed to safeguarding and promoting the welfare of adults, children and young people and protecting them from the risk of harm. To achieve this we have dedicated national and local Safeguarding Adults and Children’s Leads. Our policies, guidance and practices reflect statutory, national and local safeguarding requirements. Virgin Care provides services across Bath and North East Somerset on behalf of the Council and CCG. All agencies involved in providing care and support for adults work together to respond in a coordinated way to cases of suspected harm or abuse of adults. In partnership with Bath and North East Somerset Council, our Adult Social Care teams will investigate any safeguarding concerns. In doing this we aim to ensure that people’s rights are respected and, where appropriate, advice, help and protection will be offered. Bath and North East Somerset Council are responsible for all concerns regarding the welfare of children. If you have a concern about a child or a family, please contact them on 01225 396 000 before 15 Jan or 0300 247 0201 after 15 Jan to discuss any safeguarding concern. In the event of an emergency, always ring the police on 999. ‘Safeguarding adults’ means protecting an adult’s right to live in safety, free from abuse and neglect. Any adult at risk of abuse or neglect should be able to access appropriate help to address concerns and to enable them to live a life free from violence and abuse whilst remaining involved and at the centre of all decision making. There is a duty to ensure that safeguarding enquiries will be made for any adult referred who meet the criteria. If you are concerned that a vulnerable adult is at risk of abuse, harm or neglect, please contact us to discuss your concerns by phoning Virgin Care on 01225 396 000 before 15 Jan or 0300 247 0201 after 15 Jan. In the event of an emergency, always ring the police on 999. On evenings, weekends and bank holidays, phone the Emergency Duty Social Work Team on (01454) 615 165. If the adult is in immediate danger always phone the police on 999. The non-urgent police number is 101. Please also refer to Bath and North East Somerset Council’s Safeguarding advice. We will work in close collaboration with other agencies to fulfil our responsibilities to vulnerable adults, to prevent both the risk and the experience of abuse or neglect. Ensure that the adult’s wellbeing is promoted and that the adult’s wishes, feelings and beliefs are always at the centre of decision making, ensuring that safeguarding is made personal to them. 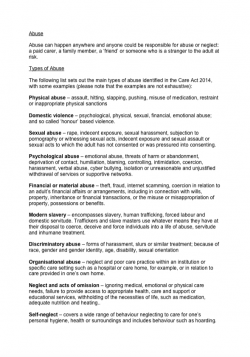 Local Safeguarding Adults Board (LSAB) information, leaflets, posters or multi-agency safeguarding policies and procedures.